The Guelma is one of the original subgroups forming the Brown Atlas. Smaller and less refined, it was sometimes called a Numidian type after the ancient kingdom of Numidia which was located more or less where Algeria is today. Until recently, the Guelma in Algeria was chiefly used for work. The Cheurfa variety was even exported during the 19th century to Marseille (on the southern shore of France) where it was called ‘bœufs de Bône’. (Bône was another name for the town of Annaba located in what is now the Annaba Province on the northeastern shore of Algeria.) Their coats are grey with darker extremities. The Kef variety was described at one time as being the best indigenous dairy cattle of Tunisia. Kef and Djerba can be dark brown with almost black extremities, or fawn with light-colored legs. There are not a lot of pure Guelma left in either country due to upgrading with imported breeds; Tunisia started crossbreeding in 1888. However, the Guelma is the most numerous of the seven current varieties of Brown Atlas cattle found in Algeria and neighboring Tunisia. 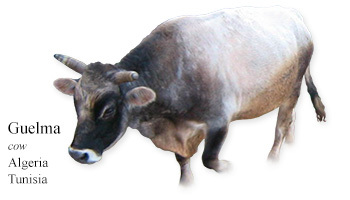 My Daily Cow® Algeria and and Tunisia and read about other Algerian and Tunisian cattle breeds.